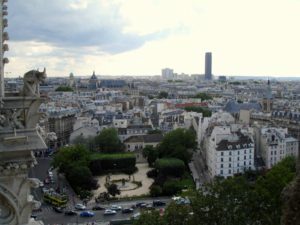 Paris: the view from atop Notre Dame Cathedral. 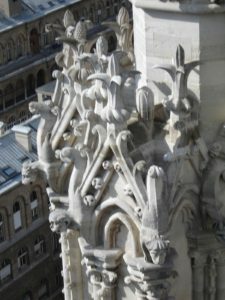 Gargoyles and pillars atop Notre Dame Cathedral. 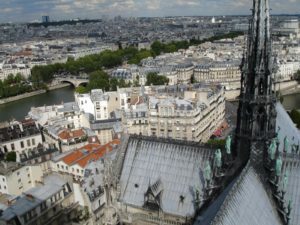 The view from above: Notre Dame Cathedral. 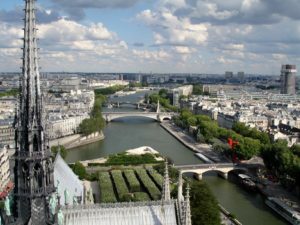 The world has reacted as you would have expected to the news that Notre Dame Cathedral was on fire. There was shock, sadness and, ultimately, a desire to help rebuild. I read that Salma Hayek’s billionaire husband has pledged $139 million dollars to the reconstruction efforts. Observers on the ground commented on the steeples that fell, which were wooden, carved from a now-long-gone forest. One can anticipate that the steeple of the future may be made of some form of metal. 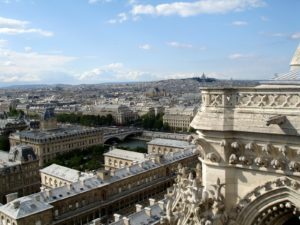 It is heart-warming to learn how beloved this symbol of Catholicism is not just to Paris but to the world. Almost universally, mourners around the world expressed their grief at the loss of such a beloved iconic structure. Democratic candidate Pete Buttegieg expressed his sorrow in flawless French (he speaks 7 languages and was a Rhodes Scholar). And then there were Presidents Obama and Trump. You can imagine which expressed his sentiments the most eloquently. One firefighter was injured and we learn that the 400 valiant firefighters were fortunate enough to salvage some important things that were inside the beloved church. The famous Rose Window has supposedly been saved, and I heard that the world famous organ had, as well. I had heard, prior to these more recent updates, that, because the structure was undergoing some reconstruction, various copper statues had been removed before the flames broke out. That would be good news for the world and for France. Supposedly the crown of thorns perhaps worn by Jesus was also saved. The world will watch as the resourceful French pick up the pieces and soldier on.